Before you bring old folks to your house make sure their shots are up to date and they are toilet-trained. Old folks like to sit around and watch TV, read newspapers or pretend to solve puzzles while secretly peeking into the back page for the answers. Leave your old folks plenty of room to walk and play. Keep your house temperature around 75F, old folks tend to feel cold. They will let you know they are hungry by shuffling around the house and aimlessly opening and closing the refrigerator. 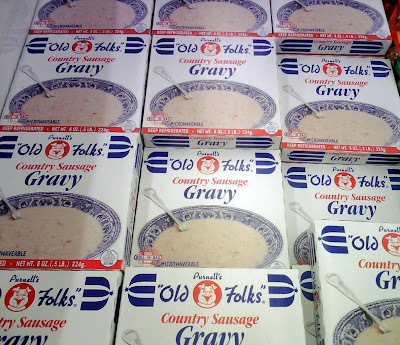 If you want to feed your old folks, there is no food they like better than “Old Folks” Country Sausage Gravy, and it says so right on the box! It’s fatty, nutritious and doesn’t require chewing. Remember to scratch your old folks behind the ear while they are eating, they will enjoy it. After 4 weeks of feeding your old folks with the Country Sausage Gravy you will notice a youthful spring in their movements and a healthy shine in their hair. They may try to use their gravy-fed youthfulness to escape. Keep your doors locked at all times. If you properly care for and feed your old folks they will provide many years of fun and companionship.